Nardwuar The Human Serviette News: Brother Ali Song About Nardwuar ! 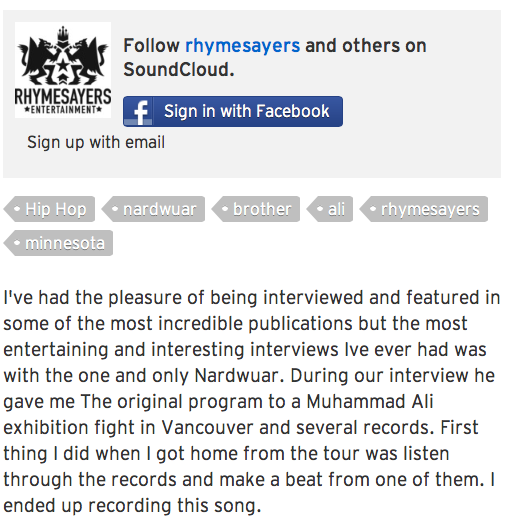 Brother Ali Song About Nardwuar ! I am so honoured! Brother Ali wrote this song about me! Doot AMAZING! Hey.. My names Dennis, I'm from Brookline MA, right outside Boston. I wanted to let you know that people are definitely pulling for you out here. Your movement is hysterical but more than that informative. You have been able to bring out the better sides of some of the biggest and most current artists in the music industry (A$AP Rocky) (Lil Wayne,) ect. Most interviewees do not dig into an artists true past to give the fans a better perspective on who that artist actually is, his musical background and knowledge of music in general. You help us to respect these artists more and they should respect you for bringing those parts of them to the public eye. I think these artists would respect the research you have done on them and who they really are, and would be able to give you informative/truthful answers regardless of your style of comedically interviewing them but it only makes the interview that much better. Again, I totally respect your musical movement and am a big fan of Vancouver and what you guys are doing out there. Keep up the good work, the sky is the limit for talent like yours.